Number of responsibilities around equestrian centre is hard to count and sticking to manual work is not only hard but also time consuming and expensive. It is especially expensive if you add up the number of people and their working hours you need to replace a good piece of equipment. On top of that it’s all the time you waste managing employees or waiting for the tasks to get finished if you’re understaffed. And if you’re an owner of a small, family ran stud you’ll find a compact tractor indispensable. This article will help you understand how useful a compact tractor can be in managing horse property. You’ll learn from it about compact tractors, attachments and implements and their applications in equestrian centre. Compact tractors in portfolio of our firm are 15-30 HP machines very similar to regular tractors in terms of look and usability but of smaller size. There’s a broad range of tractors with 2 or 4WD, with or without power steering and additional features and all of them are equipped with rear PTO providing power for multiple attachments. The biggest advantage of those machines is size. With width from 100 to 140 cm and length of 250-300 cm they’re capable of fitting and working indoors. This makes them a frequent choice of equestrian centres and stables. Daily tasks made fast and easy? Compact tractor with front loader is a must! “You must have a front loader!”. When choosing a front loader make sure it provides you the ability to quickly and easily dismount the bucket and change it to alternatives. 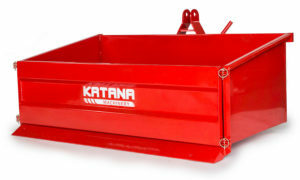 KATANA Machinery front loaders offered by our firm have easy hitching system making bucket removal possible for one operator. These front loaders can also be equipped with bale/manure spears or pallet forks. A solid 20 HP Japanese mini tractor from the 90s will manage to lift even up to 300 kgs. This means you’ll be able to transport not only small but also mid-size hay bales (e.g. 4×4, 4×5) which newer units would not manage (e.g. max lift for Kubota BX2200 is ~200 kgs according to tractordata.com). The other purpose you’ll use your machine for is pulling things. And if you think it’s only about to pull a ground leveler on your paddock you’re wrong – it can do much better than that. It will easily tow a wagon or carriage attached using a towing frame with ball or pin. We also have a broad range of tipping trailers with strong hydraulic cylinders powered by tractor’s hydraulic system. They’re capable of moving around a load of up to 1.5 tons and tipping it on one of 3 sides. Their height and construction allowing to open walls and dump on all 3 sides is specifically designed for use with compact tractors. It allows loading trailer using front loader or mini backhoe. And if you need to move and dump some smaller things and amounts you’ll gladly use a tipping transport box mounted on the back of a tractor using 3-point linkage. 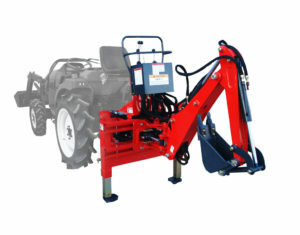 Its smart mounting mechanism allows you tipping the load with simple pull of a lever and then hitching it back with just lowering the rear arms of tractor. Can tractor do anything more? Yes! Much more! Ok, so a compact tractor will help you move things around saving your back, time and money. But it can do much better than that with proper attachments. Let’s start with some mowers to help you keep your lawns in good shape and cut hay for horses. A finishing mower, sometimes also called a rotary mower is a perfect choice if you’re looking to take a proper care of well kept lawns. It provides fine cut and thanks to its 4 stabilizing wheels it cuts on even level at all times. Thanks to high efficiency it will save you lots of time. When attached to a 4WD tractor with agricultural tyres you’ll be able to mow grass in all the conditions – even after heavy rain. 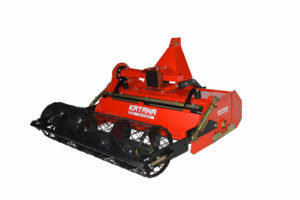 Drum mower is specifically dedicated for owners of stables and farmers planting forage on small to medium areas. Thus it may not be necessary for many equestrian centres that simply buy hay bales. Our drum mower is designed to work with 15-30 HP tractors. It cuts high sedges, grasses etc. without mulching and provides high quality swath for forage. There’s also a fair amount of groundwork you can do using a compact tractor. Of course you’ll very often use a front loader to level the ground, move around sand and soil and create heaps. There are also a few other attachments that will make your life much easier every time you decide to install new constructions or rearrange your land. 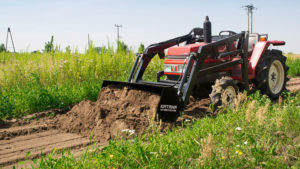 Backhoe – a rear mounted backhoe for compact tractors is a great and cheap substitute for compact diggers. For very reasonable money you get an attachment providing you full usability of a backhoe including 180° arm’s swing, over 2m digging depth and replaceable buckets with many sizes. You’ll find it useful in all the landscaping and construction related jobs at your ranch. And most importantly, it will break even just after using it a few times when compared to cost of renting a mini digger or landscape contractors. Post hole digger – this PTO driven heavy duty auger will be irreplaceable when fencing your ranch and paddocks or even installing obstacles. 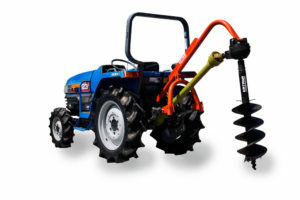 There’s a range of augers available for compact tractor post hole borers from 8 to 14 inches. 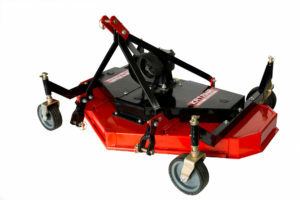 Stone burier – it is a must if you’re about to seed grass. You can think about it as a much more advanced brother of a rotavator. Thanks to its blades, with different construction than rotavator’s and moving opposite direction it buries stones and debris on the depth of ~10-15 cm. They are then covered with fine, freshly tilled and aerated soil which is at the end nicely leveled by the roller. This whole process prepares ground for planting grass in one go. If you found this article interesting or inspiring and if you have any questions about how compact tractor can help you improve efficiency of your stables send us a mail at info@compact-tractor-ireland.eu or call us at 0892 20 50 88.